Porrentruy (German: Pruntrut) is a Swiss municipality and seat of the district of the same name located in the canton of Jura. 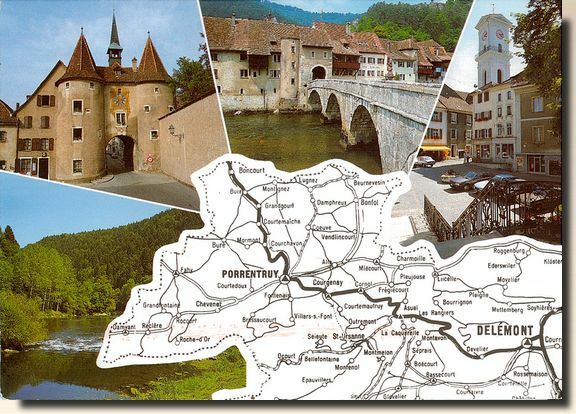 The municipality lies on both sides of the Allaine River, in Ajoie (the bulge in the northwest corner of Switzerland that extends into France) at the foot of the Jura Mountains on the north. In addition to the wide valley of the Allaine itself, it includes the watershed of the Creux-Genat River, that flows down from the peaks of La Banné (511 m) and La Perche (526 m). In the north, the municipality includes the hills and forests of the Petit Fahy (543 m) und Grand Fahy (570 m). The highest point in the municipality is the ridge that divides it from the municipality of Bure at 580 m.